The Florida Probate Code And Rules Pass Constitutional Muster? Introducing the RPPTL Practice Series! Delayed Discovery Doctrine: How Long Does A Litigant Have To Bring An Undue Influence Claim? Practice Corner: Probate and Trust Division - The Attorney-Client Privilege Is Alive And Well, Hallelujah! E-recording: All The Cool Clerks Are Doing It! Estate Of Powell: The Service Wins The Latest Round, But Did It Land A Significant Blow? Why Not Become Board Certified? I’m Still Standing: Revocable Trusts—Do Beneficiaries Have Standing To Assert Claims Against Trustees? By Douglas G. Christy, Esq., Becker & Poliakoff, P.A. Can You Imagine? Notarization By Skype? Is it Time to Expand Florida’s Slayer Statute? What Happens to the Rent After Exercise of a Lease Purchase Option? By Jared E. Smith, Esq. and Dara L. Jebrock, Esq., Rumberger Kirk & Caldwell, P.A. Practice Corner: Estate Planners - Are You Planning for the Post-Death Fight? Can Johnson v. Davis Rights Be Waived? Pratice Corner: What to do When you Discover an Error in a Recorded Deed? Jax Utities v. Hancock Bank: Equitable Remedies No More? Can I Have My Deposit Back? The Meaning of “Of Counsel”: Do We Know It When We See It? By Bridget M. Friedman, Esq.,Friedman & Friedman, P.A. Chair’s Column: May You Live in Interesting Times! New CFPB Disclosure Lets Buyers “Know Before They Owe” …But Will It Really Help Buyers At The Time Of Contract Signing? By John W. Little, III, Esq. and E. Ashley McRae, Esq. By Steven H. Mezer, Esq. and Christopher N. Davies, Esq. By: Keith B. Braun, Esq., David J. Akins, Esq., and Pamela O. Price Esq. Planning for Second Spouses and First Marriage Children and (Surprisingly) Making Everyone Happy! By Michael A. Sneeringer, Esq. By Jane L. Cornett, Esq. By Michael G. Meyer, Esq. By Brian W. Hoffman, Esq. and Christopher W. Smart, Esq. By Lawrence J. Miller, Esq. By Stacey A. Prince-Troutman, Esq. by T. John Costello, Jr., Esq. by Julia L. Jennison, Esq. By James A. Marx, Esq. By Larry R. Leiby, Esq. By Bridget M. Friedman, Esq. Undue Influence – Is Failure to Establish a Presumption Fatal? By Sean M. Lebowitz, Esq. By Brian M. Malec, Esq. By Melissa N. VanSickle, Esq. Chair’s Column: Our Financial Resources From Whence Cometh? To Where Goeth? Is a Construction Defect Plaintiff Entitled to Prejudgment Interest for Unrepaired Defects? Check Your Dec—Is Your Right of First Refusal at Risk of Being Refused? By Kathryn Yankowski, Esq., Katz Barron Squitero Faust Friedberg English & Allen, P.A. Frank Aragona Trust: A Way Around the Imposition of the NII Tax for Trusts? The Annual Kozyak Minority Mentoring Picnic was a Huge Success! By Steven H. Mezer, Esq., and Christopher N. Davies, Esq. Lapsing: Who Needs It Anyway? By Robert “Bob” S. Schumaker, Esq., Trenam, Kemker, Scharf, Barkin, Fry, O’Neil and Mullis, P.A. Tips for Mediation – Be Prepared! 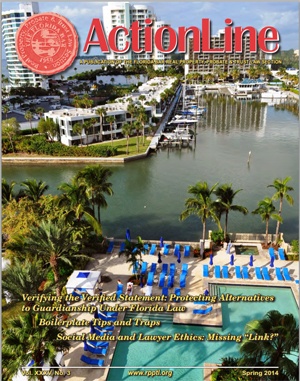 Practice Preparedness: Are You Prepared to Practice In Any Florida Jurisdiction? Can’t We All Play by the Same Rules? When Is It Too Late to Foreclose a Mortgage? Is My Client A Liar? Who Needs A Safe Harbor from the Economic Storm? Fellowship Program Open to All Young RPPTL Attorneys! Do Leasehold Cooperatives Qualify as Protected Homestead? It Depends…. Lougas v. Sophia Enterprises - Is There a New Way to Terminate A Lease? Social Media and Lawyer Ethics: Missing “Link”? Tiara: A Sea of Change or Barely a Ripple? Request for Information: Violations of Sec. 627.4137, F.S. By Stephen A. Wayner, Esq, C.E.S. County Court Jurisdiction in Landlord-Tenant Actions for Possession—Does § 34.011, Florida Statutes, Need to Be Clarified? CLE: Attorney Fees: Statutes, Contracts, Rules, Ethical Consideration and Fatal Mistakes – Who is Going to Pay You?